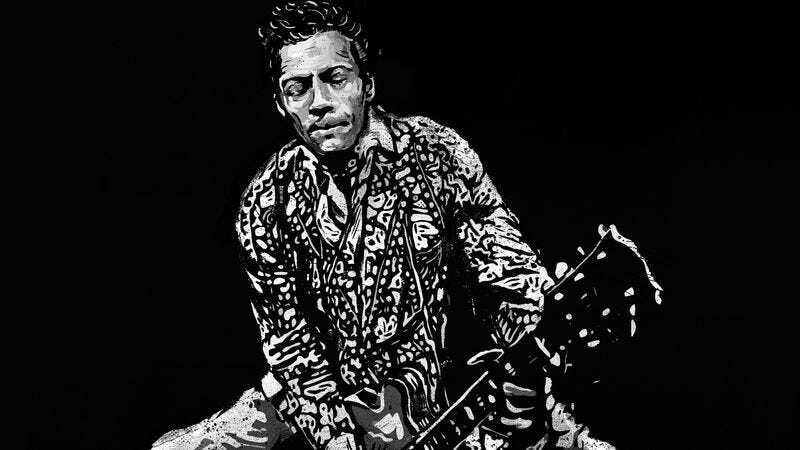 Chuck Berry, the man whose very name John Lennon suggested as a synonym for rock ’n’ roll, is celebrating his 90th birthday today with the surprise announcement of a new album. Scheduled for release in 2017 on the Nashville-based Dualtone Records label, Chuck will be “comprised primarily of new, original songs written, recorded and produced” by Berry himself. This is a fairly big deal, since according to his own autobiography, the last time Berry ventured into a recording studio was February 1979, when he laid down tracks for a mostly forgotten LP called Rock It. After an astonishing run of groundbreaking hits beginning in 1955 with “Maybellene,” Berry largely began coasting in the 1970s and beyond, his reputation tarnished by perfunctory live shows, endless re-recordings of old triumphs, and numerous legal entanglements. Chuck looks like a good faith attempt to end his career on a high note. In recent years, Berry has been bearish on his own future in music. His standard answer to the press has consisted of a bit of rhyming verse: “Give you a song? I can’t do that. My singing days have passed. My voice is gone, my throat is worn, and my lungs are going fast.” Nevertheless, Berry continued performing regularly and drawing crowds at a St. Louis restaurant called Blueberry Hill, where he played his 207th live show back in August. He will be assisted on Chuck by his “longtime hometown backing group” from those Blueberry Hill gigs, an ensemble that includes two of his children, Chuck, Jr. and Ingrid, as well as bassist Jimmy Marsala and drummer Keith Robinson. Berry is dedicating the new album to Thelmetta “Toddy” Berry, his wife of 68 years and surely one of the most patient and understanding spouses in all of rock history.